Can any of you squeak hackers help fix a bug in Scratch on 64 bit installations of Ubuntu / Linux? Well, I can't seem to reproduce the bug.. Though of course, I downloaded the package and installed it manually. Would that make a difference? Thanks for trying! You're on a 64 bit Ubuntu 12.04, right? Version 1.4.0.6~dfsg1 of the Scratch package? Argh, that looks nasty. It reminds me of when I was experimenting with my own Morphic engine and working with windows. Does Squeak have any control over the window itself, or just the viewing frame inside the window? 64 Bit Ubuntu 12.04 (Precise) with this package: scratch_1.4.0.1-0ubuntu5_i386.deb (Still have it in my Downloads folder ). Hope that helps. Can you try it with the newer package, from the repositories? It looks nasty cause it is! I'd love to see it squashed. I'm not much of a squeaker at all, but from what I understand you can control window size / handle resize events from within squeak programs. I'm not able to reproduce this on Lubuntu 12.04 with Scratch 1.4.0.6~dfsg1-1~ubuntu12.04.1. The window does flash black while I'm resizing it, but works fine once I let go. Thanks for trying! We've just recently isolated the problem to Ubuntu's 3d (unity) system. When running in 2d mode, as I suspect Lubuntu does by default, the bug doesn't happen. So installing on a 64 bit system doesn't appear to be a causal factor - we've since seen it happen on 32 bit installations of Ubuntu. If you find out more about this bug, please comment here! Just another update- this looks to be caused by an issue with compiz. So, no need to dive deeply into this, unless you want to try to help isolate it! Anyway, I doubt Lightnin would knowingly put his topic in the wrong section. 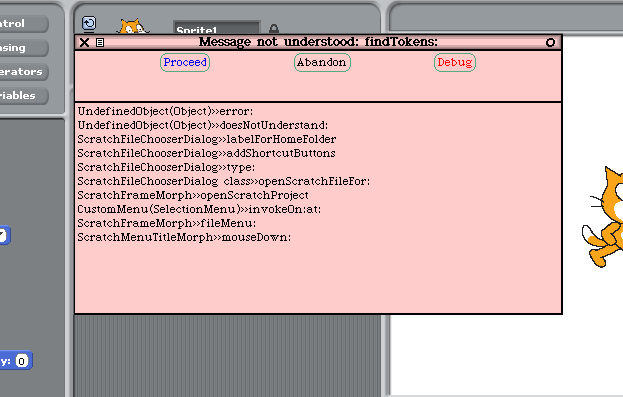 VMOPTIONS="-encoding UTF-8 -vm-display-x11 -xshm -plugins /usr/lib/scratch/plugins/:$SQ_DIR/"
Apperently this bug is due to some issue between X and Compiz, so if you do not use Unity 3D then you don't see this bug. Just thought I would spread the knowledge, making it easier to find for the next seeker. edit: No shrinking under 2d. Huh. I'll try the workaround. bye 1.4, we all loved you. but we all outgrew the site. 2.0 is a welcome change. Does this have anything to do with the bug where when you go out of presentation mode the program crashes? I'm on Fedora 17, 64-bit.